After being nominated by Islandmomma a couple of weeks ago for the Capture the Colour Competition organised by Travelsupermarket.com – I´ve finally got around to getting my act together! The competition has five categories, one for each of the colours – red, blue, white, yellow and green. Each category winner will receive an iPad3, and the overall winner will receive £2,000 to be spent on travel……which would come in very useful. Despite having travelled extensively, I have decided to keep these photos within the theme of this blog, East of Málaga – except for one, which I took in nearby Seville. So, here goes! Surely you´ve heard the expression “like a red rag to a bull”? 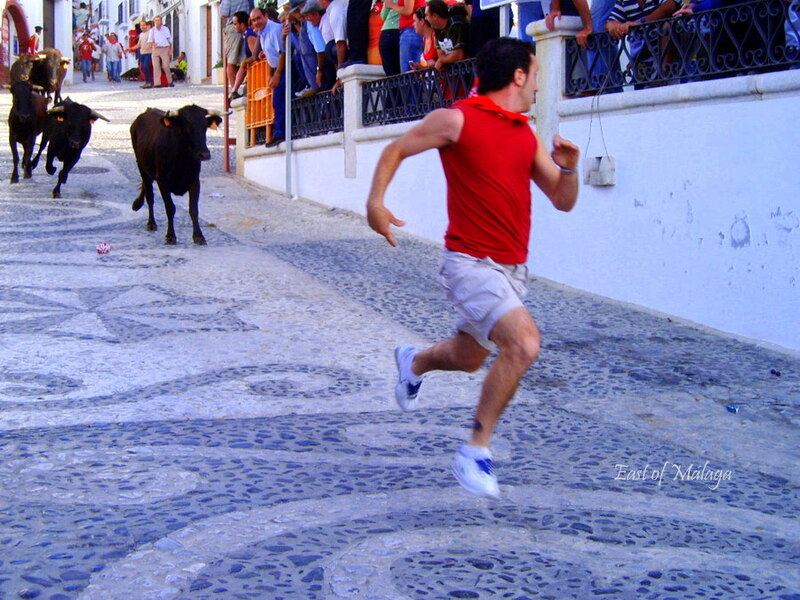 Well, I think it can be taken quite literally during the Bull Run in the white, mountain village of Frigiliana. This event is held each year, early on the Sunday morning of the Feria weekend, in June. A much smaller version than the Bull Run held in Pamplona, both in terms of attractions and certainly in the size and age of the bulls, it is nonetheless no less exciting for those participating. No bulls are harmed at this annual festival. Notice that the guy´s feet are both off the ground and a blur as he nervously glances over his shoulder to try to ensure that there remains sufficient distance between him and the charging young bulls! 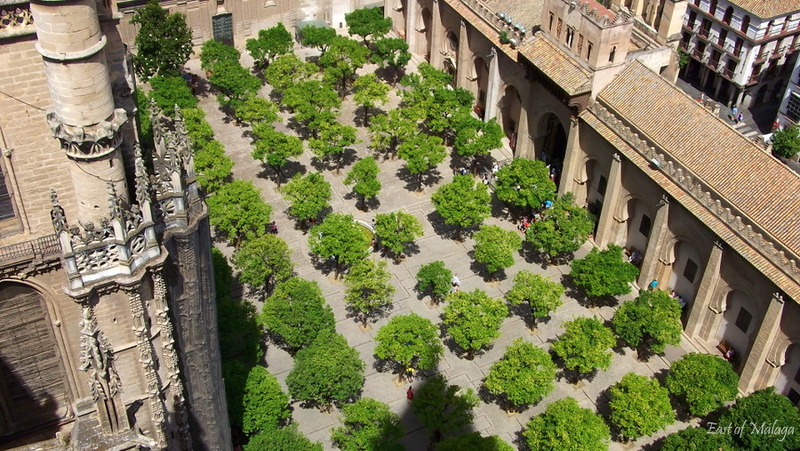 Here you can see El Patio de los Naranjos (Orange Tree Courtyard) within the confines of Seville Cathedral, viewed from the near the top of the spectacular Giralda Bell Tower. What I particularly like about this photograph is that you can see the pointed shadow of the top of the Giralda Tower in the foreground and that the vivid green leaves of the orange trees are the only focus of colour, drawing the eye to them even more. The Giralda tower is unusual to climb as there are no stairs, but ramps around the four sides, with viewing windows every three or four levels. The ramps were installed so that in years gone by, horses could be ridden to the top. Sure saves the legs up the 37 levels! 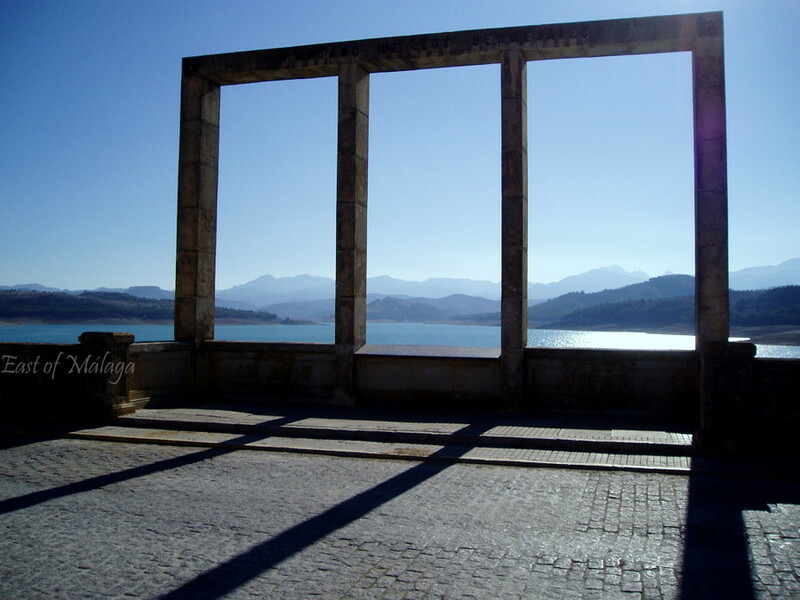 The framing structure overlooks the Presa de las Bermejales, a large lake (and man-made reservoir) situated in the west of Granada Province, o­n the northern boundary of the Natural Park of Las Sierras de Tejeda, Almijara y Alhama. This secluded spot, far from the usual tourist trail, is a haven of tranquility especially during the very busy month of August. It´s a beautiful place to spend a peaceful few hours or days, enjoying nature at it´s best. I love the way the silhouetted structure frames the layers of hazy blue mountains disappearing into the distance. 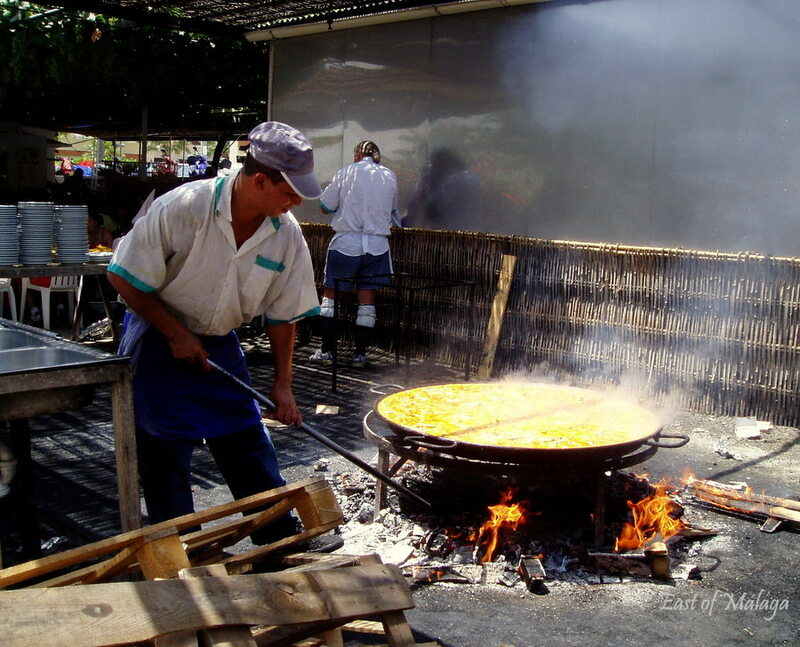 East of Málaga wouldn´t be Spain without a giant-sized paella being cooked over a wood-fire at Chiringuito de Ayo on Burriana Beach in Nerja. Surrounded by palm and banana trees, Ayo´s Restaurant is something of an institution, serving up delicious food for over 40 years. There is no need to book a table but you will have to take your chances, along with everyone else, in trying to secure the next one coming free – but that´s all part of the fun! Locals flock to Ayo´s in their droves to sample the mouth-watering paella, there is always a great atmosphere AND you can can queue up for a second plate – free! Mmmm … you can almost smell it from there, right? My final photograph was taken during Spring-time from my house in the countryside, looking down the valley towards the Mediterranean Sea. Of course, the water isn’t visible as there is a thick sea mist pouring inland. On days when the mist rolls in, there is a constantly changing scene. Sometimes the white-washed fincas on the opposite side of the valley can be clearly seen. Other times the cloud completely surrounds the valley below our villa and obliterates our view of everything. This is a magical time. It’s as if we are the only people on Earth and the house becomes “our castle in the clouds”! Which photographs would you choose for blue, green, white, yellow and red? This entry was tagged Andalucía, East of Malaga, Europe, Frigiliana, Malaga, photography, Seville, Spain, white villages. Bookmark the permalink. Lovely choices Marianne, especially love your blue! Good luck! Pingback: CBBH Photo Challenge: PINK | East of Málaga .... and more! It´s the taking part that matters most – and you did such a beautiful job, Diana. Well done! Thanks again for the nomination. I didn’t have time during the week and when I completed it today I noticed the fine print… contest closed Aug. 29. Oh well it was still fun. Glad you managed to sneak your entry in time. I know I didn´t give you much notice – sorry! Loved your green photo. Isn´t the Atarazanas market in Málaga fantastic? I would love to be able to shop there for fresh produce every morning. yes, that place sounds terrific!! we’ll have to plan that definitely! and actually? I had already seen an earlier entry from another blog that I follow and thought it would be fun to do. and then I had to go to Florida to take care of my elderly mother and well, I didn’t have alot of time to blog. so, no worries!! You wouldn’t catch me showing red to a bull. The photos are fantastic representations of the various colors needed for the challenge. I love the first one. I hope he ran quick enough to keep from getting hurt. Yes he did – don´t worry! ….but this IS the Costa del Sol – the eastern end of it, anyway! Where abouts are you Serena? How far will you have to travel to get here? I went into Nerja this morning and it has quietened down a bit since many Spanish tourists are gradually returning home after their August holidays. 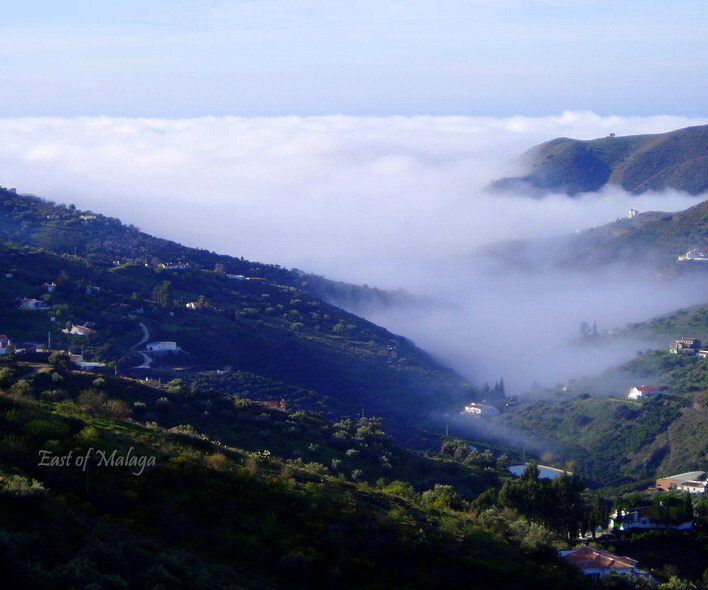 I´m sure you would enjoy Frigiliana – a few kilometres inland from Nerja. As you approach along the autovia – come off at the first Nerja exit and when you get to the roundabout turn left to Frigiliana instead of right to Nerja. How about a walk along the River Chillar? If you need any more information just give me a shout! Wow but they are all gorgeous! If you twisted my arm I think I would choose the blue because it almost took my breath away when I saw it & I got this lovely calm feeling! Lots of luck! The blue does have a calming effect, doesn´t it? I think we are all going to need lots of luck, judging by some of the entries I´ve seen! Thanks for the nomination, Linda. Love that red photo. Really exciting, especially for the guy running with both feet off the ground. 🙂 Good luck with the competition. Most people seem to like the red photo best. Good luck Marianne. I like the red the best – it really captures the action! Oh yes, it certainly captures the action!! Thanks so much for the nomination. I hope to get this together soon. Calling for a typhoon on Thursday so maybe no school 😉 then I can have some extra time to enter… otherwise it will have to wait until the weekend. I just keep thinking what a beautiful spot you live in, Marianne! And I’ve climbed the Giralda Tower- where was I looking? I don’t remember the orange trees… observant, that’s me. I’ve loved seeing everyone’s entry for this. So much variety. That blue’s still a killer shot. Very nice! I still like that silhouette pic! Makes sense because it is so hauntingly (I must work on my spelling) beautiful! Thanks Paula. Have you entered this competition yet? Nope. I guess it requires an invitation? No, it doesn´t, but I´d be happy to nominate you if you like, as one of my five has already entered. One of five what? I am not familiar with the rules.. Besides I think it is too late now. One of the five bloggers I nominated..
OH OK – there are only a few days left until the competition closes anyway. That’s cool. Who among the five nominees entered? Great shots. The red one is my favourite. I’ve also participated for the fun of it and as you said, it wasn’t easy to pick which photos to use. Thanks and good luck with your entry, too! Hmmm … my heart was beating fast when I took it! Great entry, Jennifer. Good luck! I love those photos! 🙂 Especially the blue of the Presa de las Bermejales, Didn’t you use that in another post? Anyway… it’s beautiful. Love it. Yes, I just used it recently for Ailsa´s Travel Theme Photo Challenge entitled Silhouette – but I felt it was good enough to use for the Capture the Colour competition too! The RED photo is quite dramatic, isn´t it? Awesome awesome entries! I’m not just saying that because you nominated me. I say it not only because I’ve been to Spain. (I got rammed by a bull in Jerez!) the pictures are so awesome because it’s very interesting. I esp. Love the paella caption. i didn’t know they prepare it that way. A big one from a wooden fire, that would be much more authentic than from restaurants! Your white picture is just oh so breathtaking. …and did you also know that the yellow colour of the paella comes from the use of saffron in the liquid added to the rice mixture? There are so many white villages around here that my easiest choice would have been one of them for my WHITE picture, but I was blown away by the sea mist rolling in that I had to use that one instead! Glad you like it, Rommel. Great photos, very strong images – the red action shot is fab, and I love the idea of using the trees in the patio de naranjas for green. Beautiful photos, red is my favourite. These are fabulous Marianne – you’re so clever with your camera! Did you notice that I´ve nominated you? Wow! Great entries for the challenge. I love the yellow paella, that just leaps out of the picture, and runner with the red shirt. Great photos!